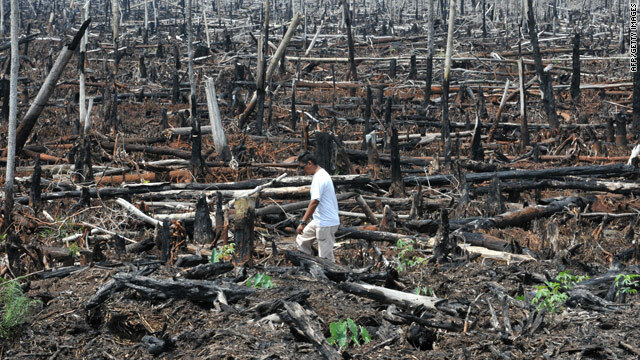 A Greenpeace campaigner walks through destroyed peatlands in Indonesia in October 2009. (CNN) -- One of the world's largest pulp and paper companies is destroying Indonesia's rainforests and taking away the habitat of rare animals, environmental group Greenpeace charged Tuesday. The Greenpeace report accuses Asia Pulp and Paper of "relentlessly trashing rainforests, driving species extinction and, if left unchecked, will threaten Indonesia's efforts to address climate change." APP, a division of Sinar Mas, denied the charges levied by Greenpeace, including the alleged expansion of logging operations by 17 million hectares (42 million acres). "The allegations are totally illogical and untrue, Asia Pulp and Paper has no plans for the expansions in question," said Aida Greenbury, an APP spokeswoman, who said the Indonesian government has publicly announced that their quota for pulp and paper is 10 million hectares (25 million acres) by 2014. "I urged Greenpeace to do a proper research before putting such allegations" Greenbury added. Sinar Mas, which also has a palm oil arm, has long be a target of Greenpeace efforts to curb deforestation. The environmental group says the land cleared for palm oil plantations, and for pulp and paper products is doing long-term damage to Indonesia's rainforests and the environment. Greenpeace says a $1 billion deal between Norway and Indonesia announced in May to reduce greenhouse gas emissions through a moratorium on logging has a loophole that would allow APP to clear sensitive forest and peatlands. "Millions of hectares of forests -- including hundreds of thousands of hectares under Sinar Mas control -- are not part of the deal with Norway," said Bustar Maitar, a Greenpeace Southeast Asia forest campaigner. "This loophole will undermine all attempts to reduce Indonesia's emissions. President (Susilo Bambang) Yudhoyono must act immediately by implementing a moratorium on all forest destruction and ensure the protection of peatlands. Only then will we be able to really reduce Indonesia's GHG emissions." Indonesia is one of the world's largest emitters of greenhouse gases because of rampant clearing and burning of its forests and peat lands for logging and conversion into palm oil plantations. The country has long been a target of harsh criticisms from environmental groups who have accused the government of failing to enforce its own laws. Yudhoyono said in May that Indonesia would "conduct a moratorium for two years where we stop the conversion of peat land and of forest." He was joined by Norwegian Prime Minister Jens Stoltenberg, who said Norway would provide $1 billion to Indonesia to help with the effort to reduce deforestation. "Indonesia is a key country in terms of reducing deforestation. Therefore this agreement and Indonesia's commitment is a great step forward in achieving large-scale reductions in greenhouse gas emissions," Stoltenberg said. Yudhoyono said the halt on new concessions would start in 2010 as part of a broader strategy to reduce the nation's greenhouse gas emissions by at least 26 percent by 2020. Deforestation accounts for almost a fifth of total greenhouse gas emissions that cause climate change. The Indonesia-Norway partnership to cut emissions is part of a broader international strategy called Reduced Emissions from Deforestation and Degradation, or REDD, that would make stored carbon dioxide in tropical forests a commodity that can be bought and sold on the global market.